KIEV, Ukraine -- Ten years after the "Orange Revolution" Ukraine appears to be leaving that path to democracy and returning to its Soviet past. Can its course be changed? When more than 1 million Ukrainian citizens joined forces in 2004 to call for greater democracy, their "Orange Revolution," as it became known, not only caught the attention of the world's media, but later served as a model, and in some cases as an example, for citizens movements in Tunisia, Egypt and Libya. The main drag in Kiev was awash with the orange banners that gave the gentle protest movement its name. Demonstrators flocked to the capital from all over the country, determined to lend their voices to the calls for change. "It is time!" they shouted. Time for greater freedom of opinion, democracy, a clampdown on corruption. But that was not to be, and almost a decade on, not many Ukrainians would be willing to take to the streets in the name of democracy. They have grown too weary for that. "We are disappointed. We don't believe the improvement, justice and honesty that we were waiting for will come," says Natalya, a Kiev resident who believes the political elite caused the problem. "A fish always rots from the head down." Following the revolution, its political protagonists Viktor Yushchenko and Yulia Tymoshenko were elected as president and prime minister respectively. But the idealized hero and heroine of the protest movement failed to deliver on the promises they had held aloft in that sea of orange. "Neither of them kept to their word," Hanna, a student says. "Yushchenko talked about basic economic, social and moral improvements, but they failed to materialize." Teachers, Hanna says, earn the same now as they did then, which is a pitiful 100 euros ($130) a month. The failure to stamp out corruption, speed up the reform process or run the country in a more inclusive way stopped the advance of democracy and ultimately put the opposition at the helm. In 2010 Viktor Yanukovych was elected as president, albeit it with a very narrow majority. Since taking up office, his policies have undone the few democratic improvements that put in place during post-revolution years. A constitutional reform from 2004 was abolished and the president was granted greater power, while press freedom and freedom of speech were restricted. What's more, just a few days after his election, Yanukovych appointed his former comrades to several key judicial positions. Under Yanukovych, an economist from the industrial region of Donetsk, there is no trace of democracy in parliament, the armed forces or the judiciary. But what his system of rule has spawned is a number of new turns of phrase. "The power" is how Ukrainians refer to the government and state apparatus, with its overpowering network of personal connections ever ready to preside and decide at will. "The family," as in relatives, friends and acquaintances of the president, is at the heart of this power. The network includes oligarchs and Forbes list candidates such as Rinat Akhmetov, who has an estimated personal fortune of $15.4 billion, or Viktor Pinchuk, son-in-law of former president Leonid Kuchma. Among the wealthiest in the country is Olexandr Yanukovych, the current president's eldest son, whose does business in the construction, mining, banking and energy sectors. Ukraine is also home to "technical" parties, founded in order to weaken the larger opposition parties, as was the case in the 2012 parliamentary elections. And then there are the dubious "administrative resources," which are funds earmarked for schools and hospitals in districts, towns and villages that secure the desired election results. Against this backdrop, many Ukrainians now consider the word democracy to be synonymous with capitalism, enrichment and endemic corruption. Lawyer Valentyna Telytshenko, says Ukrainians are involved in corruption at all levels. "It starts with having to bribe the local authorities to be allowed to sell pancakes in a kiosk," she says, adding that it ends with people buying off judges in the highest courts so they make decisions that contravene the law. 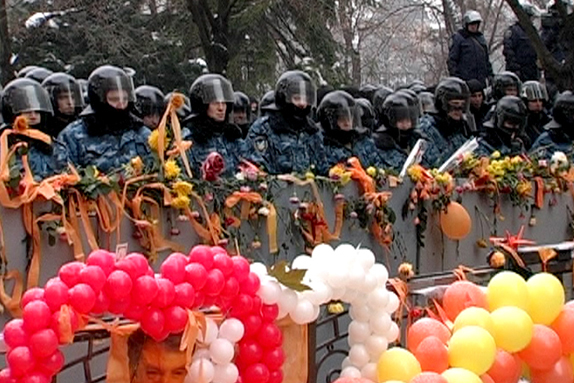 Telytshenko had just finished her law studies when she took part in the 2004 demonstrations. These days she applies the same conviction she took to the streets to justice in her country. She is representing the family of the journalist Georgi Gongadse, who was murdered in 2000. It is a case with a political background that the courts and the government wanted to file away and forget about, but which despite a series of trials, remains unresolved. Investigative journalist Tetiana Chornovol has made it her mission to reveal the current extent of corruption and cronyism in the country. "It used to be a matter of millions that simply disappeared," she said. In the pursuit of information, she has posed as a guest or a waitress to sneak into family celebrations of oligarchs, she has scaled fences and recently even acquired a drone equipped with camera. "I wouldn't do that anywhere else, but in a country like Ukraine where the power hides everything from the electorate, I think it is right to work with these means," she said. The only trouble is that her revelations rarely have any real consequences. Much of the population is resigned to the situation, and those who want to live differently tend to leave. Almost four million Ukrainians are living abroad, be it on a temporary or permanent basis, and many of them are well-educated members of the middle class. The situation, which leaves little or no space in the government, the media or public realm for political opposition, makes the work of the many small NGOs that refuse to go away, all the more important. "Opora," which translates as "arrow," is one such company. Oleksandr Neberykut and Olga Streljuk, who run the company, use open letters and demonstrations to get involved in the passing of new laws, thereby sending a message that they are following Ukrainian politics with a watchful eye. To greater and lesser degrees, some 50 people are involved in Opora, which is based in a modest office in an old building in the city of Lviv. Together they are trying to uphold the spirit of the democratic movement of 2004. Strejluk says there was massive disappointment when the orange movement failed to bring about change, but she still thinks it is important that civil society use its voice. "Ukraine is heading back to its Soviet past," she says, adding that the next two years leading up to the next presidential elections are critical, and potentially difficult for organizations such as her own. But that will not stop her and her fellow campaigners from doing whatever they can to see the promises made almost 10 years ago finally become a reality. Because the alternative is a dictatorship, and that doesn't bear thinking about.